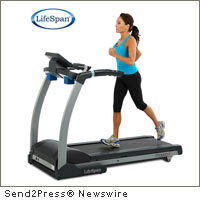 SALT LAKE CITY, Utah, March 17 (SEND2PRESS NEWSWIRE) — The LifeSpan TR3000i treadmill, made by PCE Health and Fitness (www.lifespanfitness.com), is the Best Budget Treadmill as chosen by voters in the About.com annual Readers’ Choice awards. The LifeSpan TR3000i treadmill was selected over all other treadmills, including leading brands such as Bowflex®, NordicTrack and Proform. The LifeSpan Fitness Club provides each member a personalized online account to consolidate and manage exercise data and vital statistics in one place. The TR3000i console includes USB technology, allowing workout data to automatically save to a USB device for easy uploading into the member’s account. The LifeSpan Fitness Club helps members lose weight, reduce medications, train for upcoming runs, and simply live healthier. Members set goals and plan physical activity by creating personalized workout calendars. They enter exercise data and vital stats manually or by uploading data from their USB device. And they stay engaged in their health and fitness through motivating progress reports. With higher healthcare costs and rising obesity, fitness equipment is challenged to do more than provide a good workout. Success with USB technology and the LifeSpan Fitness Club has led LifeSpan to incorporate it into a suite of exercise equipment and health monitors including the LifeSpan blood pressure monitor and digital bathroom scale. The recent awards from About and Fitness Professor acknowledge LifeSpan as a fitness industry leader, integrating quality innovative fitness equipment with online health and fitness management. – RSS news feed for PCE: https://send2pressnewswire.com/author/pce-health-and-fitness/feed .